Orange Beach condominium for sale at Cotton Bayou. 3BR/2BA overlooking the marina and Cotton Bayou. If you haven't experienced Cotton Bayou Condos, you're missing out. Quaint complex located in the heart of Orange Beach. Large marina with all 1st come/1st serve boat slips. Owners say they've never had an issue getting a slip!! Have your boat in the back yard. The unit is turnkey so you can literally drop your bags and enjoy (never been rented). Enjoy evenings watching the beautiful sunsets and dolphins right from your balcony. Fish and crab from the boat dock. Large outside storage unit to hold all of the beach and boat toys. Do not let this one pass you by! 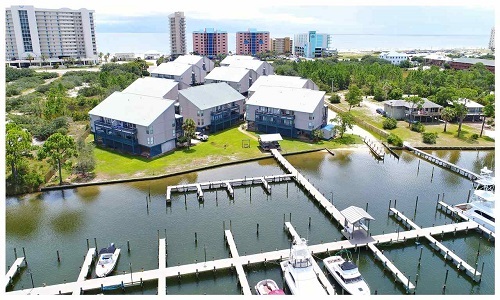 Cotton Bayou condos in Orange Beach is a low-density complex, this waterfront community has 68 secluded residences. The property is situated in the Terry Cove, which provides easy access to the back-waters and the Gulf of Mexico. This condominium development is located near the state public beach & public boat-launch ,as well as being is convenient to numerous local dinning, shopping and entertainment venues.